L to R: David Chow Yun Kai, Tay Yoke Sing and Lim Boon Dak. L to R:Leonard Chak, Tay Yoke Sing, Cheong Sang and Ng Koon Huat. MACVs from Klang Valley visited WO 1 Tay Yoke Sing (Rtd) at Selayang Hopsital recently during the festive period. 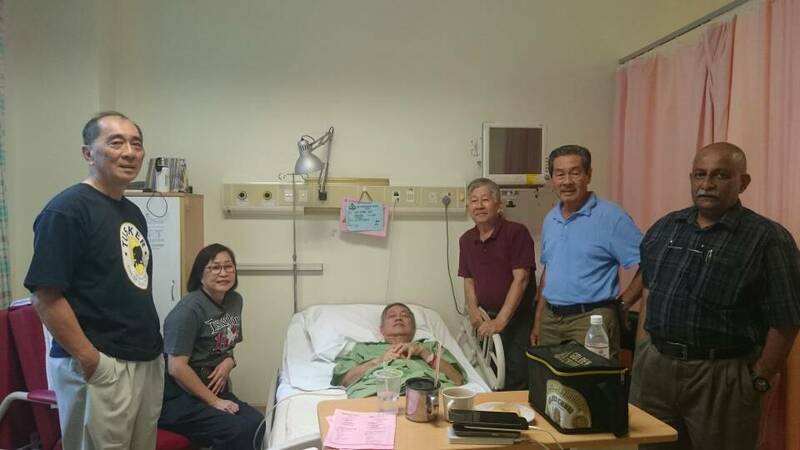 He was admitted since 12 Feb 18 for breathing difficulty and was visited earlier by Maj David Chow Yun Kai (Rtd). 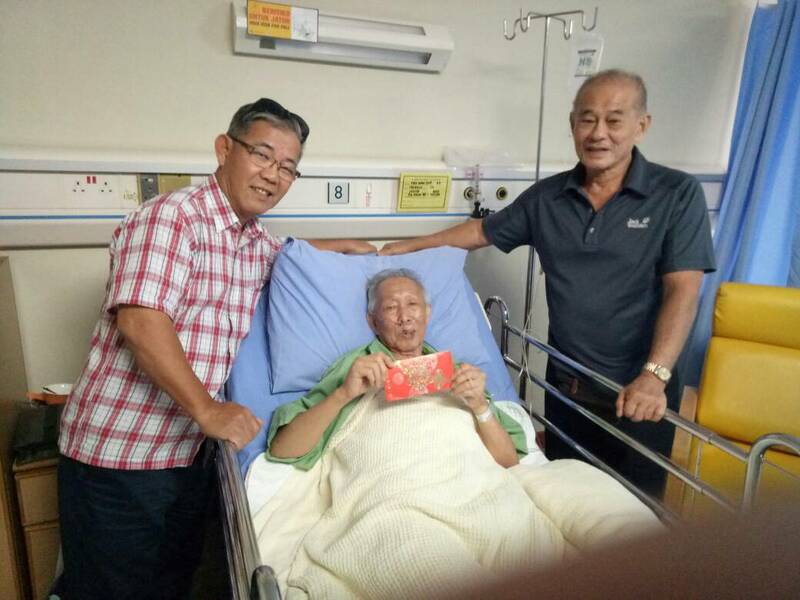 On 20 Feb 18, both Maj David Chow Yun Kai (Rtd) and Maj Lim Boon Dak (Rtd) visited him to cheer him up and wish him well. They also presented him with a Get Well Ang Pow. On 21 Feb 18, Maj Ng Koon Huat (Rtd) and Maj Cheong Sang (Rtd) visited him and brought more cheers. Both presented him with New Year Ang Pow and wish him a speedy recovery. The support by all in both visits show great comradeship among MACVs. Kudos to all who have made the effort. It is one of MACVA objectives to render assistance and support to its Veteran members who are in dire need of help and we pray for his speedy recovery. Maj Tan Pau Son (Rtd) visiting at Seremban Hopsital. L to R:Maj Ng Koon Huat (Rtd), Maj Cheong Sang (Rtd) and Brig Gen Dato' Wee Han Siew visiting at HAT Tuanku Mizan. L to R:Maj Chong Heng (Rtd), Lt Col Carol Loo (Rtd), Maj KK Lee (Rtd), Maj Andrew Teoh (Rtd), Lt Col Liew Wai Tong (Rtd) and Maj AR Ramachandran (Rtd) at HAT Tuanku Mizan. MACVs visited Maj Lee Kong Kok (Rtd) at HAT Tuanku Mizan on 7 Feb 2018. He is recovering from a stroke he suffered on the evening of 27 Jan 2018 at home and was initially admited to Seremban Hospital. The visiting MACVs comprises of MACVA President Maj Tan Pau Son (Rtd) and Klang Valley Army members including serving officers who took time off to visit their comrade and wish him well. He thanks all MACVs for their support, prayers and well wishes. MACVs RMN members also visited Lt Goh Kim Bah RMN (Rtd) and David Mak Chill Hoong at IJN Kuala Lumpur on 6 Feb 2018. Goh completed his medical test and will be reporting back to IJN on 11 Mac 2018 to do the angio procedures. David is crrently under observation and medication. They both expressed their thanks for the MACVA visit. The support by all in both visits show great comradeship among MACVs. Kudos to all who have made the effort. It is one of MACVA objectives to render assistance and support to its Veteran members who are in dire need of help and we pray for their speedy recovery. L to R:Goh KIm Bah, Ng Thian Yew, David Mak Chill Hoong, Joseph Chia and Robert Tang. MAVCs visiting Rear Adm Dato' Mohd Som RMN (Rtd). MAVCs visiting PO Ismail RMN (Rtd). MACVs visited Rear Adm Dato' Mohd Som RMN (Rtd) who just had a successful heart surgery at IJN Kuala Lumpur on 29 Jan 18. On the same occasion, MACVs also visited PO Ismail RMN (Rtd), an ex PASKAL who is shedule to have his heart surgery on 30 Jan 18. The visiting MACVs comprises of Klang Valley RMN members who took time off to visit their comrades in arm to wish them well and a speedy recovery. Both of them and their family members are very thankful and appreciated the MACVA visit. MACVA RMN VP First Admiral Datuk Kay Hai Thuan RMN (Rtd) was present with wife Datin Joyce Tan. This small effort shows great camaraderie and comradeship among MAF Veterans. Bravo Zulus to all who have made the effort. L to R:Cheng Tak Wee, Chang Yu Kuan, Wong Kwai Yinn, Leong Swee Thin, Beh Huat Soon, Lim Chee Lian and Lee Ah Like. Northen MACVs visited WO 2 Chang Yu Kuan (Rtd) at his home in Bercham, Ipoh on 26 Jan 18. He is recovering from a stroke he suffered last year. The visiting MACVs comprises of Ipoh members who took time off to visit their comrade and wish him well. Chang and his wife were very happy and appreciated the MACVA visit. Klang Valley MACVs visited MCPO Patrick Chua Boon Heng RMN (Rtd) at IJN Kuala Lumpur on 29 Jan 18. He is recovering from a sucessfully heart operation performed on 27 Jan 18. RMN VP First Admiral Datuk Kay Hai Thuan RMN (Rtd) was also present to visit his comrade. Patrick expressed his thanks for the MACVA visit. The support by all in both visits show great comradeship among MACVs. Kudos to all who have made the effort. It is one of MACVA objectives to render assistance and support to its Veteran members who are in dire need of help and we pray for their speedy recovery. L to R:Ng Thian Yew, Tony Ho Weng Kong, Danny Foo Han Keong, Richard Low Qooi Tek, Khor Pai Lim, Chuan Boon Heng and Datuk Kay Hai Thuan. "MCPO Chua Boon Heng RMN (Rtd) left us peacefully at the Malacca General Hopsital at 9.00 pm on 2 Mar 18. His funeral service was held at B, PT. Lot 439, Km 8, Solok Sungai Putat, Jalan Seri Selendang, Sungai Putat, Batu Berendam, Melaka on 6 Mar 18. He was honoured a dignified military send off by fellow MACVs, Veterans and Comrades who were present to pay their last respect to their departed comrade." MACVs visited Lt Paul Kwong RMN (Rtd) at Taman Tun, Kuala Lumpur on 9 Jan 18. Paul is recuperating from a cancer operation and will be beginning his chemotherapy. The visiting MACVs comprises of Klang Valley RMN members who took time off to visit their comrade and wish him well. RMN VP First Admiral Datuk Kay Hai Thuan RMN (Rtd) was present and presented him with a Get Well Soon Ang Pow. Paul, his wife Sharan and his 2 children were happy and appreciated the MACVA visit. Northen MACVs visited Sgt Ronnie Kong Chee Chai RMAF (Rtd) at Penang General Hospital on 11 Jan 18. He is recovering from a sucessfully kidney operation performed on 8 Jan 18. The support by all in both visits show great comradeship among MACVs. Bravo Zulu to all who have made the effort. It is one of MACVA objectives to render assistance and support to its Veteran members who are in dire need of help and we pray for their speedy recovery. Get Well Soon Card for Hor Wah Sim. MACVs visited WO 1 Hor Wah Sim RMAF (Rtd) at Selayang Hospital on 14 Dec 17. The visiting MACVs comprises of Klang Valley RMAF members who took time off to visit their comrade and wish him a speedy recovery. MACVs who were present each signed on a Get Well Soon card presented to him. Northen MACVs visited Cpl Goo Pim Kim RMAF (Rtd) at Lam Wah Ee Hospital, Penang on 29 Dec 17. He underwent a successful heart bypass surgery on 23 Dec 17. The show of support by all those involved in this small effort demonstrates great comradeship among MACVs and kudos to all who have made the effort. It is one of MACVA objectives to render assistance and support to its Veteran members who are in dire need of help and we pray for their speedy recovery. MAVCs visiting Goo Pim Kim. Comrades sharing a laughter.